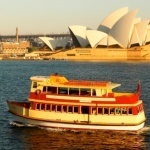 Rosman Ferries has been a leader in the Sydney Harbour transport and charter industry for close to 90 years, and continue to offer quality vessels with modern conveniences subtly incorporated into each ferry’s nostalgic look. Rosman Ferries is committed to providing the best quality service. We are always willing to work with you and to resolve any issues that you may have before, during, and after your journey. Rosman Ferries offers a range of charter services suited to any occasion including all private functions as well as corporate events. We maintain flexibility in everything that we do because we know that each client and event is different. All vessels, menus, set up, and entertainment can be adapted to your requirements.